A while back, I saw a recipe on The Kitchn for what they call Rhubodka (i.e. 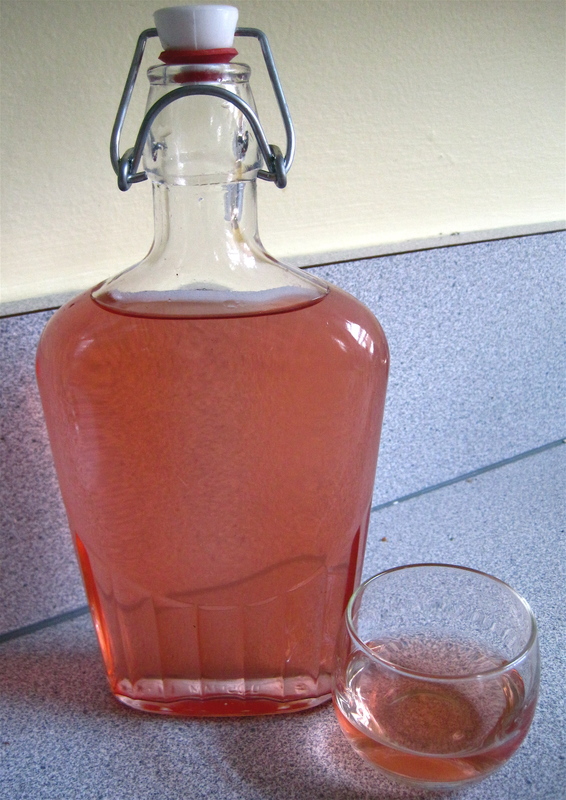 Rhubarb infused Vodka). It was bright pink (hooray!) and it just sounded summery and delicious. I had a bunch of rhubarb growing in my backyard and Monopolowa vodka was on sale – therefore, I had to make it. The recipe is quite simple (rhubarb + sugar + vodka) but it says to let the mixture sit for a month. And, I thought that a month sounded like a very long time to wait for this pretty pink rhubarb vodka. I asked a local bartender his thoughts on the matter and he said it seemed a bit too long. He suggested that I taste the infusion after 2 weeks to check the flavor. If I was happy with the flavor after 2 weeks, I could strain out the rhubarb and start using the vodka. Or, I could let it sit for another week if I wanted the flavor to be a bit more pronounced. I ended up compromising a bit – and let the mixture sit for about 3 weeks. And let me tell you, the results were delicious. Cut the rhubarb into 1/2″ to 1″ chunks. Add everything to the jar and mix well, either by shaking the jar (if it’s drip-proof) or stirring with a long-handled spoon. Store in a cool, dark place. Shake or stir the jar daily. Taste the vodka after 2 weeks. If satisfied, strain out the rhubarb and store the vodka mixture in the original jar. Otherwise, let sit for another week or two until desired potency is reached (and then strain out rhubarb). I let mine sit for about 3 weeks. Nich and I have been drinking the rhubodka with Fever Tree Ginger Beer (and calling it the ‘Rhubarb Fever’). Let it be said that my husband HATES vodka, and he loves this cocktail. It is the perfect summer drink. Since I was feeling fancy (and I had half of a handle of Monopolowa left) I decided to get creative and come up with my own vodka infusion. I also made Rosemary Lavender Vodka. 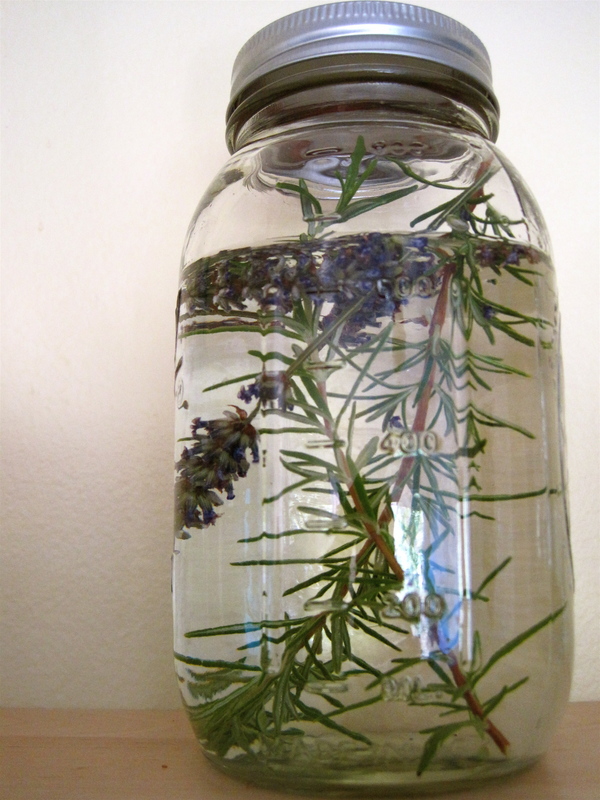 I simply combined 3- 4 sprigs of dried lavender (from my yard, of course) with 3 – 4 stems of fresh rosemary. I let this sit for a couple days (taste every day, until it reaches the potency you desire) and then I strained out the herbs. The result was a really interesting vodka – subtle and floral with earthy rosemary hints. This infusion tastes great with a little soda water and lemon. I also think that this would make an amazing lemon drop. ← on food & reading. Mmm infused liquor. I’ve got some leftover gin, and after hearing how good your infusions turned out, I’m going to try some lavender-infused gin!